Tag it . . .
Start collecting items and tagging them for the upcoming 2019 Spring/Summer Seasonal Sale which runs from March 23, 2019 thru May 25, 2019. Use 1/2 of an index card to tag each item. Cut 3" x 5" index card in half. Cardstock, any color. Make sure the ink color (black, blue or red) is visible on the card. Pin tag with safety pins only (vertically) so your garment does not fall off the hanger. No straight pins. Description on tags is important. Please include popular name brands, color of item and description. Example: Gap Khaki jeans size 12. Red Fenton vase. Blue Waverly bedspread. Use a size NUMBER not small, medium, large, xlarge, etc. Sizing page to convert S, M, L, etc. to size numbers. Ink color is important - you choose! Here's how...Write in BLACK or BLUE ink on the tag and on our special sales days the item goes to 1/2 of the price the YOU set. Example: You write $5.00 in black or blue ink on the tag and on our special sales days the price the buyer pays will be $2.50. will not be discounted even on our special sales days. special sale day(s) or not. Write your contributor code # and price on bottom of each shoe and on the tag. Please only use one tag that is attached to the shoe. Use any type of hanger for clothing with the hook facing LEFT - like a question mark (?) that way we ensure all clothing/tags are in the same direction on the rack. Safety pin top of the tag on each item through the hanger with pin vertical as shown in the examples, so it will be securely fastened. Make sure when pinning pants that they are pinned toward center of waistband on the top of the hanger so they won't fall off. Please do NOT pin them on the ends of waistbands. Price your items $1.00 or in 50 cent increments. YOU determine the price! Please bring items for the correct season - for example: no swimwear allowed in fall/winter sale. Your preassigned contributor number is located on your mailing label by your name. Call 256-233-4947, Facebook Athens Kids Mart if you don't have a pre-assigned number, have lost your contributor number or don't remember it, and/or need a new number. Everyone must sign a contract prior to bringing your articles to our store. There is no fee to do this but all the instructions, when you are paid and other details are on the contract. 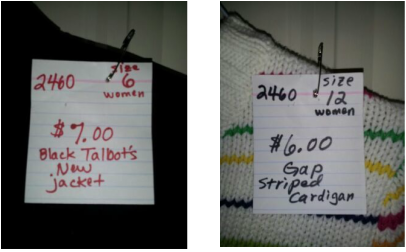 Include popular name brands and clothing color and size on the tag - such as: Gap Khaki Jeans size 10 or Red Fenton Vase, or Blue Waverly Bedspread. Use any type of hanger for clothing with the hook facing left - like a question mark (?). Safety pin top of tag on each item through the hanger as shown in the example so it will be securely fastened. No straight pins allowed. For household items and toys, tape items securely. However, don't damage the item. Tape tag on the front making it visible. Bag small items and tape shut all ziplock bags. Books - tag inside front cover with the tag sticking out. Sticky cardstock works great! Jewelry - attach on half an index card. Shoes (limited to 5 pairs ONLY!) Write price and consigner/contributor number on bottom and tie, or bag or band together. See above diagram. Clothes - (limited) 10 Women's items of clothing, 10 junior's items of clothing, and 10 men's items clothing only. Due to space limitations and more contributors signing up, we are not able to take unlimited clothing items for men, women and juniors. We will take unlimited numbers of children's clothing. ALL clothing must be clean, stain and soil free, and have no rips or tears or odors. You may replenish items as they sell. Pin sets securely by attaching through the hanger with a safety pin only. Do NOT use straight pins. Bundle and sort same sizes together, separate the sexes, use yarn, rubber bands, or ties. All clothing must be bundled separted by sexes and sized. Your bread ties work great. Label each size on the front of the box if not clothing. Label each size on the front of each bundled pile or each box if not clothing. Furniture - 30 day pick up on unsold furniture. You tag your own items and price them and we will give you 60% of the price YOU set when your item sells. Bring items in on receiving days or throughout the entire sale. However, after we are open you must stock all your items yourself in the correct places and sizes. REMEMBER!!! Stinky Stuff Doesn't Sell! NO cooking odors (oily, greasy smells)! NO mold or mildew allowed on items. We will not accept items that have these odors and are not in excellent, clean and salable condition. ​The cleaner your items are, the better they'll sell and the more money you'll make! ​If you'd like additional information, please fill out the form below.